The V200EX is referred to as an “Explosion Proof” unit. It has a pre-calibrated external EX rated IP converter mounted directly to the V200P base positioner by a short adaptor plate. For rated areas of a plant where ATEX, FM, CSA, Class 1 Div II or EEx approvals are required, this product will meet those applications. 20-100kPa / 3-15psi signal back into the positioner diaphragm chamber for mechanical positioner response. The V200EX is a two wire, 4-20mA instrument and is available for use on rotary or linear applications. It utilizes a unique spool valve, is a cam characterized, forced balanced instrument that is simple and rugged. 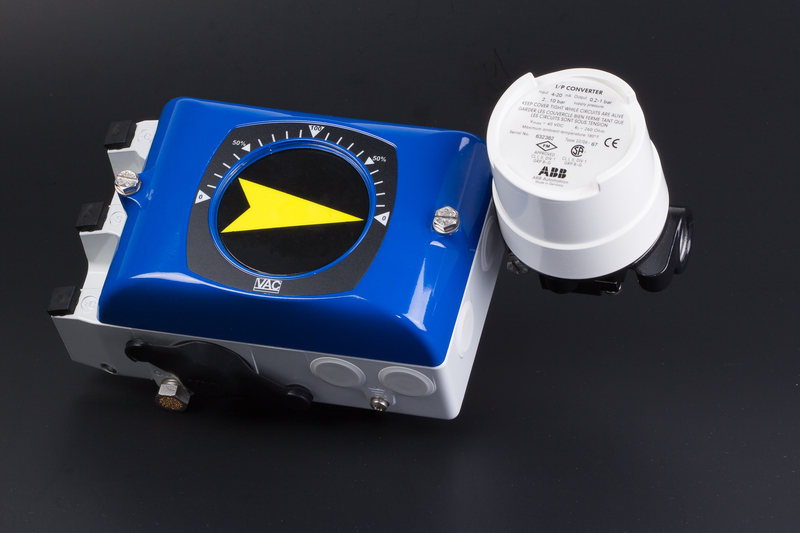 With a rugged IP66 / NEMA 4X die cast aluminum housing and an electrostatically applied polyester coating the unit has an excellent protection against a wide range of environmental conditions. The EX IP converter is available as a spare module which gives the flexibility of specifying the V200EX anywhere between the factory and the field.